So far, much of the global equity rally has been supported by investor bets that US economic growth will be strong enough to support corporate profits, but modest enough to keep the Fed from having to hike interest rates. In reality, the market gets their next look at how well that theory is holding up as earnings season kicks off in earnest later this week. Focus also remains on the prospects for a conclusion in trade talks between the US and China, as well as key events this week, including US inflation data, an ECB monetary policy decision and PM Theresa May's meeting with EU leaders beginning later today. In commodities, crude oil trades atop of its recent five-month high as an escalation of fighting in OPEC+ producer Libya overshadowed an increase in US rigs. On Brexit, the EU is said to be settling on the idea of offering an extension to Britain despite the lack of progress at home. If so, expect the EU to set a high price for delaying Brexit including the UK to potentially give up rights in future EU budget and trade talks. 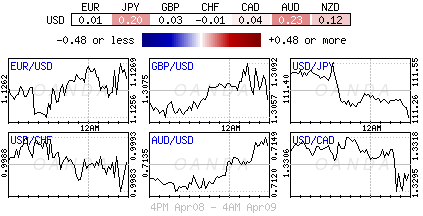 On tap: GBP GDP & manufacturing product, ECB monetary policy statement, USD CPI & FOMC meeting minutes (April10). The World Bank/IMF spring meetings begin later today. In Japan, the Nikkei ended higher overnight as tech shares and machinery stocks outperformed. The Nikkei share average ended +0.2% higher, while the broader Topix shed -0.1%. Down-under, Aussie stocks were little changed overnight, with losses among financials erasing gains from energy stocks, as investors remained cautious ahead of a looming US earnings season. The S&P/ASX 200 index climbed + 0.01% at the close of trade. The benchmark rose +0.7% on Monday. In S. Korea, the Kospi index ended small down. The index lost -0.1% at close of trade. In China, the blue chip CSI300 index rallied overnight as Beijing took steps to encourage "urbanization to support economic growth," but the broader Shanghai index ended lower on uncertainty over Sino-US trade talks. At the close, the blue-chip CSI300 index gained +0.5%, while the Shanghai Composite index lost -0.2%. In Hong Kong, stocks ended higher on China policy optimism. At the close of trade, the Hang Seng index was up +0.3%, while the Hang Seng China Enterprises index rallied +0.2%. In Europe, regional bourses have opened broadly lower, feeding through to some support for regional bond markets. US stocks are set to open deep in the 'red' (-0.6%). Oil prices trade near their five-month highs overnight as markets continued to tighten amid OPEC-led supply cuts, US sanctions against Iran and Venezuela, and escalating violence in Libya. Brent futures have hit their strongest level since Q4 at +$71.34 per barrel, before easing to +$70.99 per barrel. 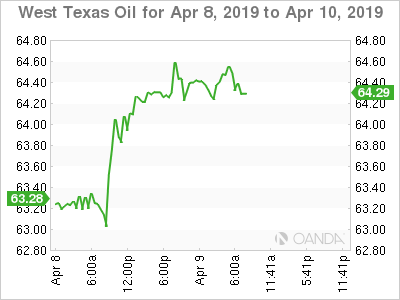 US West Texas Intermediate (WTI) crude oil futures also hit a November 2018 high, at +$64.77 per barrel, before easing to +$64.42 per barrel. Note: Brent and WTI futures have rallied by +40% and +30% since the start of the year. Crude prices have been further lifted this week by escalating violence in Libya, a significant supplier of oil to Europe, which produced around +1.1M bpd of crude in March. Elsewhere, Russia remains a reluctant participant in the supply cuts. It signaled yesterday it wanted to raise output when it meets with OPEC in June because of falling stockpiles. Stateside, crude oil production has risen by more than +2M bpd since early 2018, to a record +12.2M bpd. 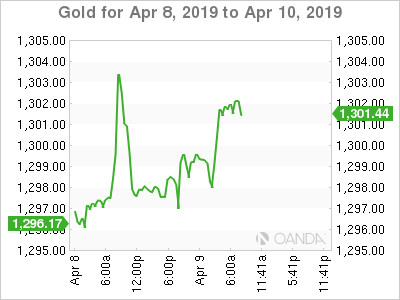 Ahead of the US open, gold prices remain better bid and are hovering atop of their one-week highs as the 'big' dollar eased on weak US economic data. Spot gold is up +0.3% at +$1,300.47 per ounce. The yellow metal touched an intra-day high of +$1,303.61, highest since March 28, in the previous session. US gold futures are up +0.1% at +$1,303 an ounce. Eurozone yields are a touch lower this morning, with concern about US/European trade tensions providing some support to safe-haven debt markets a day ahead of an ECB meeting. Yesterday, the US Trade Representative proposed a list of EU products ranging from large commercial aircraft and parts (Airbus) to dairy products and wine on which to slap tariffs as retaliation for European aircraft subsidies. Investors are also focusing on the International Monetary Fund (IMF), which it's expected to publish its half-yearly 'World Economic Outlook' later this session. Germany's benchmark 10-year Bund yield continues to hover just below zero in early trade but is up +9 bps from a three-year low of -0.09% print in March. Elsewhere, the yield on 10-year Treasury note has fallen -1 bps to +2.51%, while in the UK, the 10-year Gilt yield declined -1 bps to +1.108%. Note: Saudi Aramco, the world's largest oil company, has received +$75B in orders for its debut bond sale. FX markets remain subdued as the market shifts its focus to tomorrow's key events with ECB meeting, the emergency EU Council meeting to discuss the Brexit extension, the FOMC minutes and US CPI data. 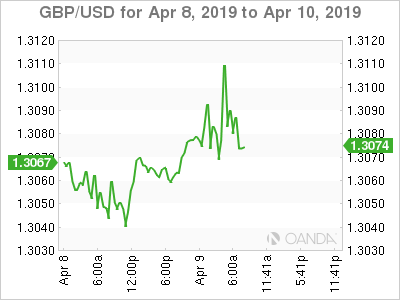 GBP/USD surprisingly steady around the £1.3075 area as PM Theresa May prepares to travel to meet Chancellor Merkel and President Macron later today ahead of tomorrow's summit that would decide on the UK extension request. Sterling, for a brief moment, did find some support, trading through the psychological €1.31 handle after reports circulated that Germany's Merkel was willing to put a five-year time limit on the Northern Ireland backstop. Dealers noted that such a limit would make it difficult for UK parliament to reject May's Brexit deal. 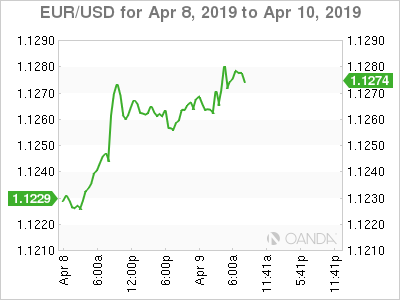 EUR/USD is flat at €1.1270 today and is not expected to rally by much due to the threat by the US administration to impose tariffs on selected EU goods in response to EU subsidies for Airbus. However, the negative impact should be more limited and less broad-based than the threat of auto tariffs, which are a larger part of the European economy. Elsewhere, the Japanese yen has advanced +0.1% to ¥111.35, the strongest in a week. Data this morning from the ISTAT showed that Italian retail sales rose +0.1% in February from the month before and followed a +0.6% increase in January. ISTAT revised up January's data from an originally reported +0.5%. Digging deeper, sales rose +0.9% in unadjusted y/y terms in February after a +1.2% rise in January (revised from +1.3%). Note: The data is expressed in 'value terms' and are not adjusted for consumer prices, which increased +1.1% in Feb from the year earlier, based on Italy's EU-harmonized index (HICP).